"Without energy, there is no meaning to the energetic, and without the energetic there is no meaning to the energy. Similarly, without Radha there is no meaning to Krsna and without Krsna there is no meaning to Radha. Because of this, the Vaisnava philosophy first of all pays obeisances to and worships the internal pleasure potency of the Supreme Lord. Thus the Lord and His potency are always referred to as Radha-Krsna. 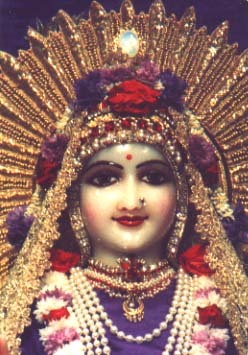 Similarly those who worship Narayana first utter the name of Laksmi, as Laksmi-Narayana. Similarly those who worship Lord Rama first utter the name of Sita. In any case -- Sita-Rama, Radha-Krsna, Laksmi-Narayana -- the potency always comes first."